According to the UN agricultural organisation FAO, in 2050 we will need 60% more food to feed the expanding world population. Even though the earth is already under relentless pressure. Consumers in poor countries associate meat, dairy and eggs with prosperity. Which means that the demand for these items will increase dramatically. As will the price. Food prices are expected to skyrocket by no less than 70 to 90% until 2030. Hunger is not caused by inadequate levels of food production. The food issue we are currently faced with is about food wastage. It is about what we eat and how we can properly distribute food. Maintaining our current consumption pattern requires an equivalent of four planets earth. Will the world go down the dead-end street of massive scales, intensification and international free trade? At the expense of billions of farm animals, and by means of excessive use of pesticides and artificial fertilisers? Or do we choose an agricultural system that functions in harmony with nature, the environment, humans and animals? Fork and knife are our mightiest weapons for the preservation of the world for future generations. 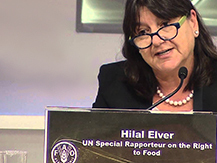 Hilal Elver was appointed Special Rapporteur on the Right to Food at the United Nations, by the Human Rights Council. She is a Research Professor of Global Studies at the University of California Santa Barbara and is co-director of the Project on Global Climate Change, Human Security, and Democracy housed at the Orfalea Center for Global & International Studies at UCSB. She has a law degree and a Ph.D. from the University of Ankara Law School. Her publications have focused mainly on international environmental law, and international human rights law.